Mini Modern: So…Where Do You Get All That Stuff? So…Where Do You Get All That Stuff? Lately, I’ve been getting a few dozen emails inquiring about where I get my modern miniatures. As any modern miniature collector knows, it isn’t easy and I definitely put in time trying to find quality miniatures. Dollhouse miniature companies are starting to offer more miniature furniture in a modern style but these attempts reflect a more pottery barn or “safe” contemporary design. If your style is one that reflects what you might find in Dwell or Living, Etc. magazines, then you often feel out of luck—especially when it comes to acquiring modern kitchens and bathrooms. I purchase about 90% of my items ready made from various retailers, and that includes searching ebay for the off chance buys. The other 10% is gluing stuff from a home improvement store and/or craft store together and creating the illusion that the piece is whatever modern masterpiece I need it to be. Imagination and creativity is what helps the most. For example, the soap dishes pictured above are not soap dishes to me, but they are bathtubs and platform beds. I just add fixtures or linens. Much of the items that I have came from all the Bozart Toys Kaleidoscope House sets, Bodo Hennig (current and vintage), vintage FlairLine, Puppenmobel and the modern AG Minis sets that were distributed by the American Girl company. Thanks to Reac Japan, I have all the modern chairs I ALMOST could possibly want. I can only hope that the Reac Company also decides to distribute other modern furniture miniatures in the same “tribute to the greats” manner. For accessories (and some occasional furniture pieces), I use Lil Bratz pieces and buy Re-Ment and Mega House items. Before my discoveries of Reac, Re-Ment, Mega House and other candy toy companies, I always scanned the action figures at toy retailers and comic book & collectible shops. Who am I kidding? I still do. The quality of action figures has been getting much better and every once in awhile figures come packaged with a nice modern chair, bookcase or other furniture and accessories. I typically buy the figure, take out the items I want for my dollhouses and either give the remaining figure to an interested friend/colleague or donate to charity. 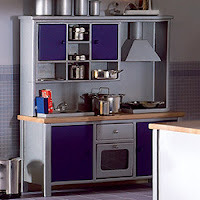 As I indicated before and often hear from fellow modern collectors, acquiring modern kitchens and bathrooms is often the “forget about it” part, but the Dolls House Emporium based in the UK has a decent selection of affordable modern kitchens, bathrooms and sets that could be bashed to reflect the level of modernism desired. I also am fond of the Colora kitchen set from Bodo Hennig and the Miele kitchen and Villeroy & Boch bathroom sets from Theo Klein. If you have the funds, I suggest Elf Miniatures or a special commission from Peter Tucker or even Mark Turpin (who has expressed interest in creating furniture). Some sites for modern dollhouses and miniatures are posted in the right frame of this site. The Dune Baron Harkonnen figure that I typically would have purchased to steal the chair if the figure had been released with the chair. I really love your work and visit your blog frequently. Just starting to 'play' with miniatures myself, I am hoping that you can verify something re. Re-ment accessories. It's referred as 1:6 and for use with Barbie dolls ... I am looking at their U.S. Fun Meals and their Bakery sets and not sure if they can possibly work in a 1:12 setting? Tks. Yes, Re-Ment is usually 1:6. I typically have to buy a whole carton of the sets. I go through each individual set with a 1:12 figure at my side (usually Mr. or Mrs. Blue-Green) to use for measurement. A few pieces do tend to work alright in 1:12. It's all trial and error.